The majority of reviewers comment that the Adidas Mad Bounce performs better and has higher quality than more expensive basketball shoes. Many of the users love how the Bounce cushion on the shoe is great for big players yet lightweight enough for small players. Damian Lillard’s fifth signature shoe with the Three Stripes is also equipped with Bounce cushioning. Some players notice that they did not experience joint pains after using the shoe, further commending the Adidas Mad Bounce’s cushioning. Due to the outsole rubber’s durability and the traction pattern’s deep grooves, testers say that the shoe can be used indoors and outdoors. Several users like how the shoe did not cause any blisters. The Mad Bounce provides great support on the ankles, a few players say. Due to the materials used, the upper and the midsole are both lightweight. 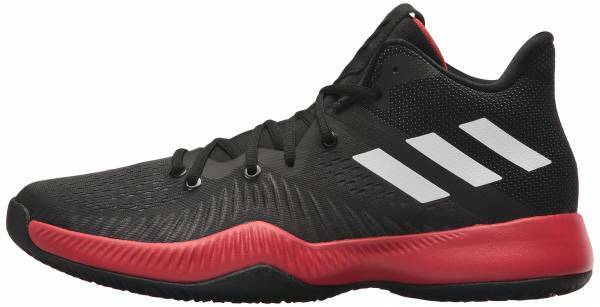 Although the engineered mesh upper is flexible, one tester mentions that these Adidas basketball shoes have excellent lateral support. Several shoe owners share how they are very happy about the well-balanced cushioning of the Adidas Mad Bounce; adding that it provides a great mix of court feel and impact protection. Majority of the commenters love how the shoe offers premium materials and excellent performance at such an affordable price. A few users are not very pleased that these Adidas shoes do not make that reassuring squeak on-court. One user says that the “forefoot lockdown could be better.” Players have the same comment about the Adidas Harden Vol 3. Some users agree that there is a tight spot in the toe area, but it loosens after the shoe is broken in. One tester says that he experienced a slight heel slippage due to the forefoot’s rigidity. A couple of players mention that the Mad Bounce’s outsole rubber picks up so much dust that regular wiping is needed. In summary, most–if not all–regard the shoe as a sleeper hit with a bang-for-your-buck price. The Adidas Mad Bounce provides premium materials, comfortable and responsive cushioning, grippy traction, and a great fit. It is recommended for guards that need a lightweight and bouncy shoe. 100 bucks. Very good price. It's premium. Come on people, I don’t think I need to further confirm that this is one of the best deals you can get right now. While a $100 price tag ranks this sneaker in the budget category, the sneaker itself & its performance says: Nah, man. I’m better than that. Adidas footwear designer Dillon Patrick focuses the Mad Bounce’s design on providing the right amount of midsole bounce and just the right amount of lateral forefoot support to hit that optimal spot for explosive basketball players. Cushion. As the shoe is aptly named, the Adidas Mad Bounce uses a full-length Bounce cushion that provides a flexible and ultimately bouncy ride. Although thinner than regular Bounce midsoles, the shoe surprises with its enhanced comfort, impact protection, and energy return. Traction. The traction on the outsole implements the same "brain coral" pattern used on the Crazy Explosive 2017. The grooves in the rubber are deep and will be no problem for small debris and outdoor use. Length and Width. The Mad Bounce fits true to size. Although some users noticed that the shoe is narrow in the midfoot, regular footers can go with their standard Adidas basketball shoe size. On the other hand, wide footers can go half a size up. Lockdown. The shoe’s semi-narrow form, along with the Adidas Tech Fit booty and the neoprene tongue, makes sure of the shoe’s excellent fit and secure lockdown. There will be no slips when you are in the Mad Bounce. The Adidas Mad Bounce has engineered mesh in the toebox area of the upper upto the midfoot. On the shoe's back portion is a soft, sock-like knit, providing a very comfortable bed for the heel. The shoe also features a neoprene tongue that stretches over the foot. Seams on the shoe are overlaid with fuse for support and added durability. A torsional plate is inserted into the midsole, guiding the foot's movements and reducing injuries. The shoe’s silhouette shares similar features with the Crazy Explosive 2017 and the Harden B/E. However, the shoe ups the ante with the addition of knit in the Mad Bounce’s heel area. Function is fused into the shoe’s aesthetic, as exemplified by the vertical forged ribs on the lateral side of the Mad Bounce. These lines are placed not only for the shoe to have added zonal support but also to give the Mad Bounce character. In the same area as the forged ribs, the midsole peaks slightly to provide a barrier during banking. The shoe was initially released in three colorways. It also has the option for customization on the Adidas website. These budget Adidas basketball shoes are available in several hues.